I posted this recipe back in April of 2011 and thought I should bring them back up since Christmas is almost here. I make these for Christmas morning every year. Easter, too. I LOVE these rolls. They are soft, sweet but not too sweet, and bursting with orange flavor. These are SO GOOD!!! If you love the Pillsbury orange rolls but want a preservative-free alternative, these are your rolls. These are now my favorite breakfast rolls. Loooove them! I've adjusted the recipe using rapid rise yeast. I rarely have the patience to wait through two risings, so I prefer the speed of using rapid rise yeast. For directions on how to make these with regular yeast, click on the link to the original recipe. Just note that I have adjusted the amount of orange zest in the dough and changed the filling and frosting from the original. Combine 1 1/2 cups of the flour with the rapid rise yeast, sugar, and salt in a mixing bowl. Combine water, orange juice, and melted butter in a microwave safe bowl or measuring cup and heat to 120-130 degrees. Mix in liquid with flour mixture until smooth. Add egg and orange zest. Beat in enough of remaining flour to make a dough easy to handle. Knead dough on a lightly floured surface for 5 minutes or until smooth and elastic. Let dough rest 10 minutes in a lightly greased bowl. Meanwhile, combine 1/4 cup sugar, cinnamon, and orange zest in a small bowl. On a lightly floured surface, roll dough into a 9x15 inch rectangle. Spread with softened butter and sprinkle with sugar mixture. Roll dough, lengthwise into a 15-inch tube, pinching to seal. Using dental floss or serrated knife, cut into 1-inch rolls (should make 15 rolls) and place in lightly greased 9x13 baking dish. Cover with plastic wrap and let rise in a warm place until almost doubled in size. Preheat oven to 375 degrees. Bake for 12-15 minutes or until golden brown. 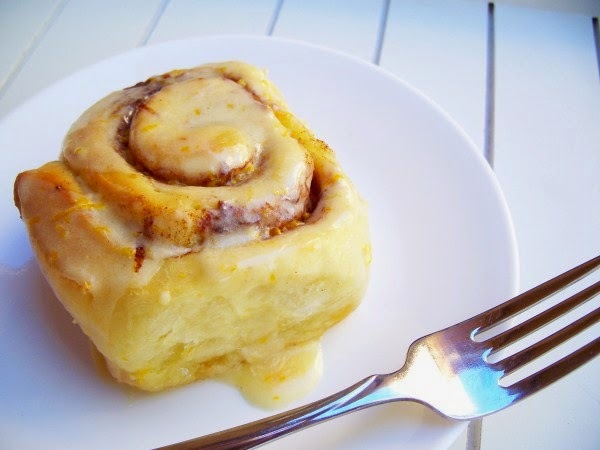 To make frosting: in a medium size bowl, beat powdered sugar, orange juice, orange zest, vanilla, and butter until smooth. Spread over warm rolls.